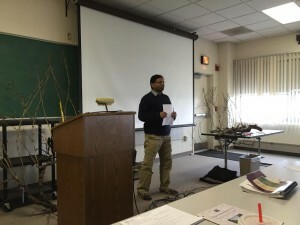 On Wednesday, February 17, 2016, the Rutgers New Jersey Agricultural Experiment Station held a pruning workshop at the Rutgers Agricultural Research and Extension Center in Bridgeton, New Jersey. From expecting 15-20 attendees, the workshop ended up having 48-50 participants. Every seat of the seminar room was filled within ten minutes of the start time! The two hours were packed with information, including both indoor presentations and outdoor demonstrations. Dr. Gary Pavlis started off the workshop discussing pruning terminology to make sure everyone began with the same level of understanding. Then, Dr. Dan Ward demonstrated pruning equipment and pruning practices, with an emphasis on the concept of balanced pruning. Some other topics included pruning with winter injury and adjusting to grape variety. Dr. Hemant Gohil (picture right) went over the advantages and disadvantages of spur vs. cane pruning using ‘Lemberger’ vines as props. The workshop was well-received and the knowledgeable hosts are interested in making this an annual winter tradition. 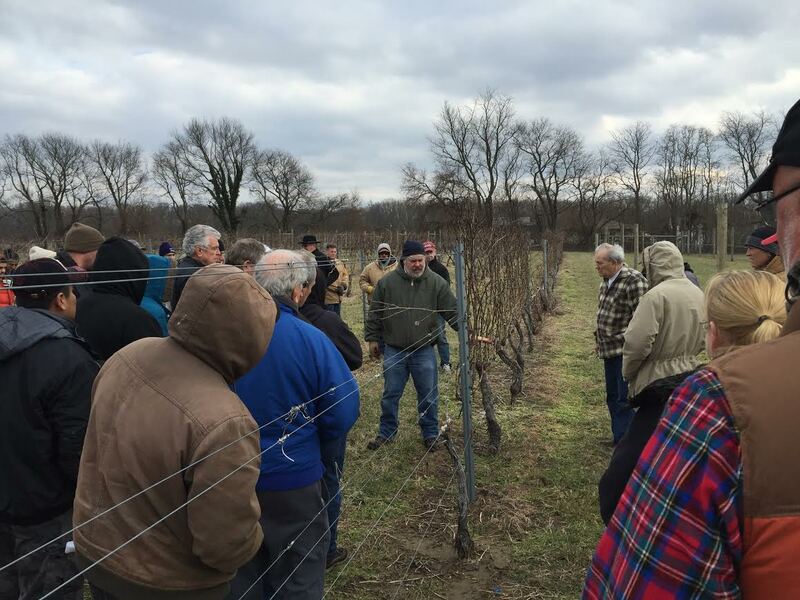 If you would like to receive notifications about upcoming workshops hosted by the New Jersey Center for Wine Research and Education, please contact njcwre@gmail.com with your contact information. Dan Ward demonstrating pruning methods at the 2016 Pruning Workshop.